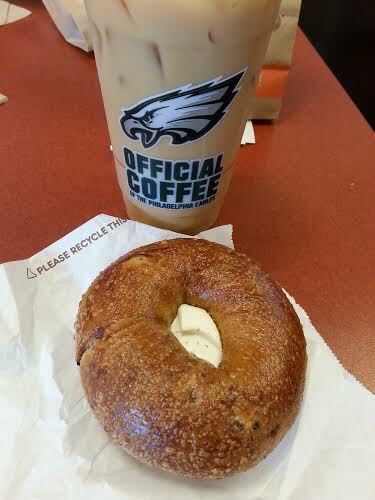 Wednesday already and it’s time for another addition of What I Ate Wednesday. It’s always fun at Jenn’s party over at Peas and Crayons. Be sure to catch up on what’s going on with everyone over there when you’re finished here. I have the feeling that a lot of people will be posting Thanksgiving prep photos. Or maybe that will come next week. Regardless, you’ll get none of them from me today. As the title indicates, I’ve been eating out too much. Last Thursday, Ralph and I went out to lunch at a diner we don’t go to very often. There were not a lot of vegetarian choices. For example the Greek Salad comes with chicken mixed in to the salad! 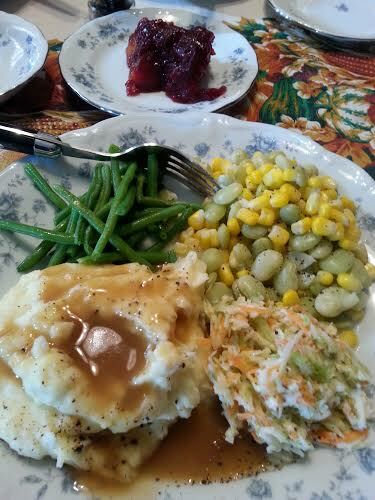 I know I could ask for it to be left out, but that doesn’t bode well for the veggie at the table. The did have a great side salad. Rarely do they come this big. 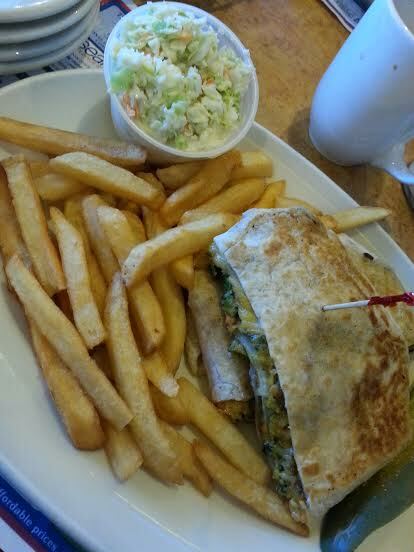 I noticed they had a veggie burger on the menu and asked for it made as what they called a fajita burger. It had sautéed onions and peppers and cheese on it. The veggie burger was sort of destroyed in the process, but it still tasted good. 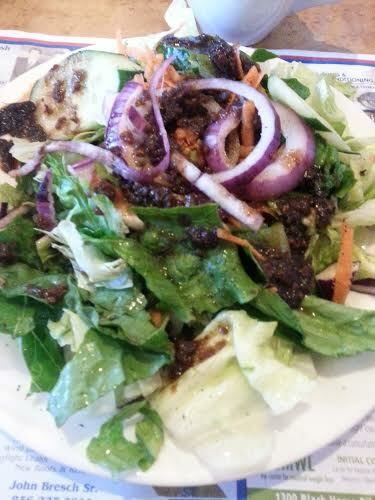 If I had known that the side salad was so big, I would have just asked for that with the veggie burger on top. That will be my choice the next time we go there. We also had lunch at a local pizzeria that we don’t go to very often. We were there last week and I discovered something on their lunch specials menu. 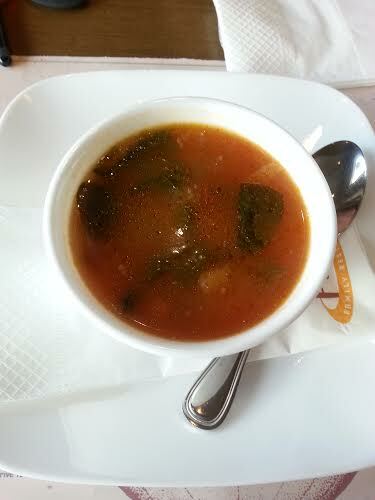 You start with soup…I picked their vegetable which they assured me was purely vegetables. It is very light, garlicy and delicious. 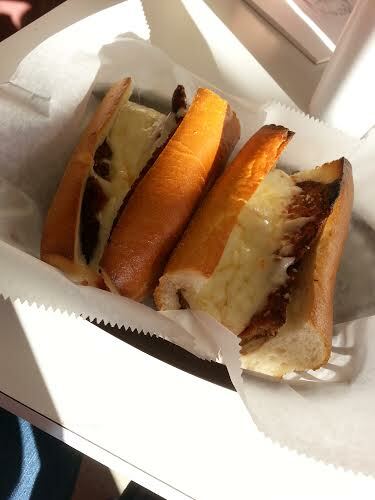 It comes with a grilled cheese sandwich on Texas toast. 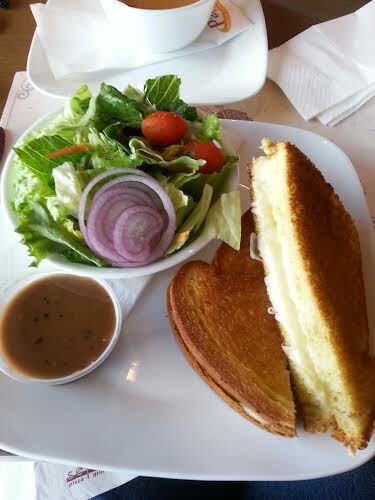 It’s supposed to come with french fries, but they’re happy to substitute a side salad. I got mine with balsamic vinaigrette. This was really good. It’s not greasy the way some grilled cheese sandwiches are. Fairly high in Points for me, but very good. 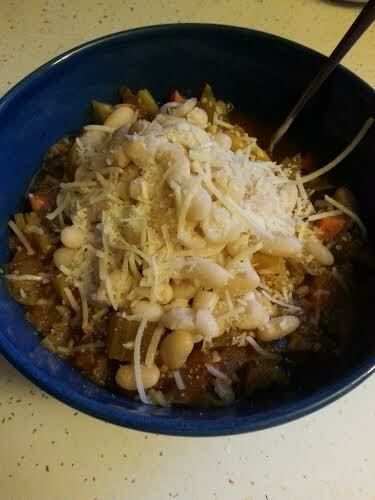 Included in this week’s food was of course a crock pot full of my Weight Watchers veggie soup. But no pictures. I also think I’ve finally found how to make perfect black beans in the crock pot. I don’t think I’ve been cooking them long enough. I need to try it again to see if I’m right then I’ll post about it. That’s WIAW for me for this week. Be sure to check out all of the fun over at Peas and Crayons. You’ll find lots of great food and fun ideas there. Strange But Good~That’s A Weird Breakfast! It’s been a few weeks since I joined in on Strange But Good hostessed by Laura at Sprint 2 The Table so I thought I’d join the party! There are always so many crazy good food ideas there. Be sure to check it out. 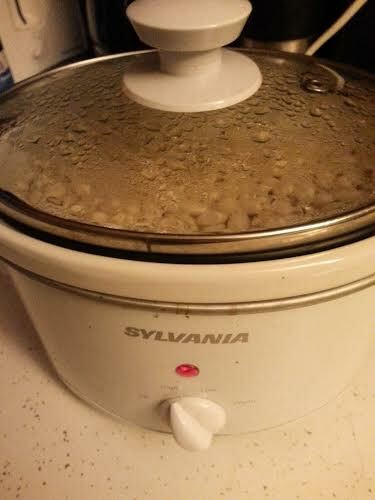 I started out the week making a crock pot full of one of my favorite things…Lentils. Everything was going smoothly. 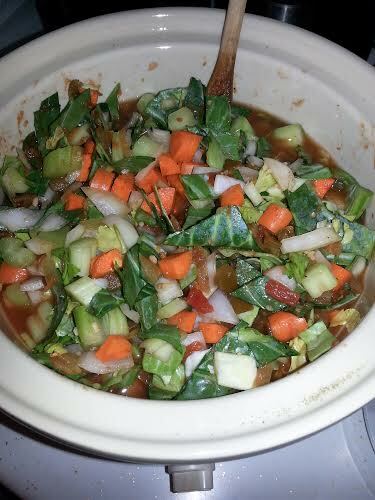 After that I started on a pot of my Weight Watchers Veggie Soup. In the midst of making the soup, I suddenly realized that I’d made a mistake with the lentils. Usually, I put in a cup of dried lentils into my small crock pot with onion, garlic and seasoning. As I was throwing scraps into the trash can I noticed the bag from the lentils…I had put in the Entire Bag!! Often on BCDC I talk about foods that are not attractive but tasty. This dish certainly fits into that description. 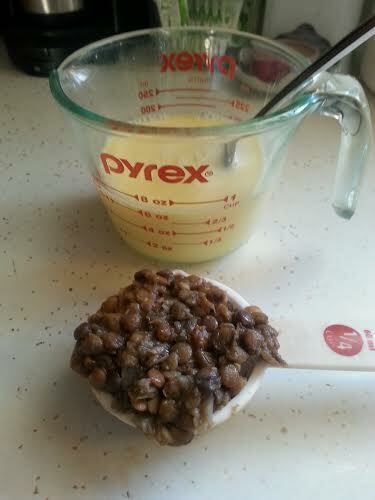 To my usual mixture of egg substitute and egg whites, I added a quarter cup of my cooked lentils. 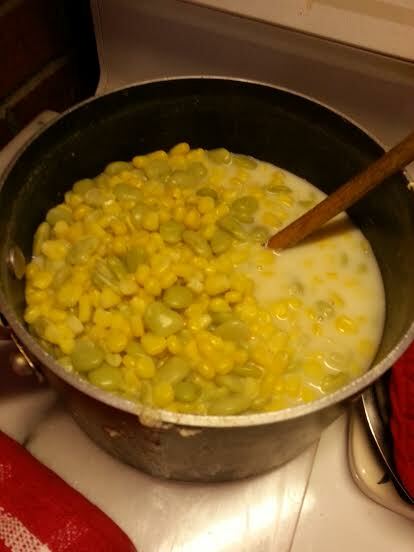 I also added in some Mrs. 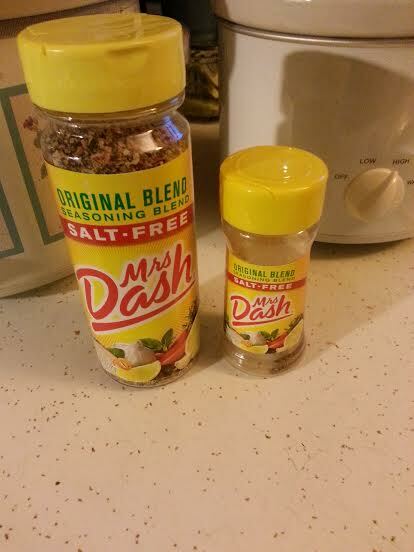 Dash and crushed red pepper flakes. Not pretty in the measuring cup. 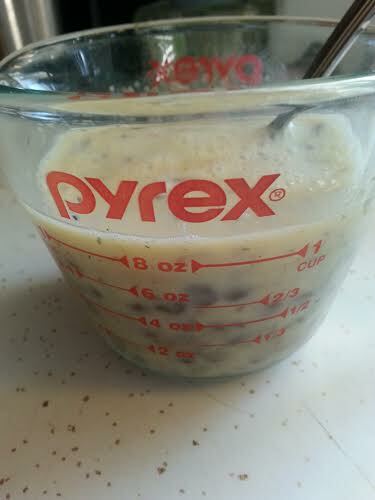 Not pretty when mixed in with the egg substitute. 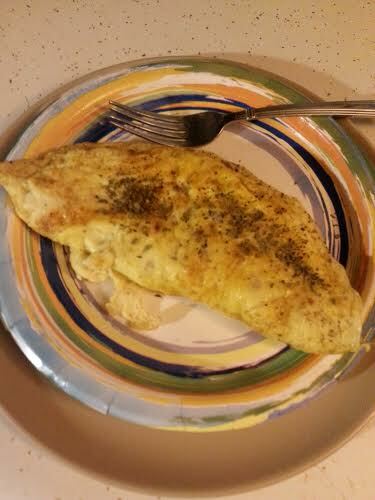 Not really all that pretty as a finished omelette. I added some shredded 2% cheese inside and on top. Not photogenic, true. 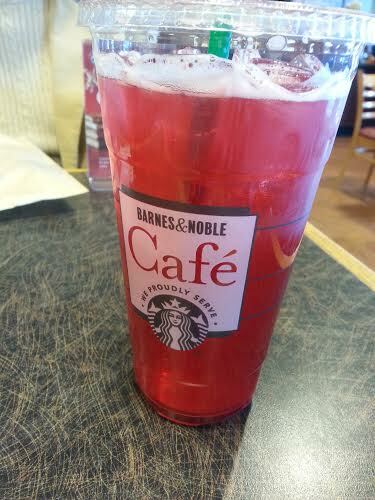 But really, really good! Almost more importantly, it was also extremely filling. 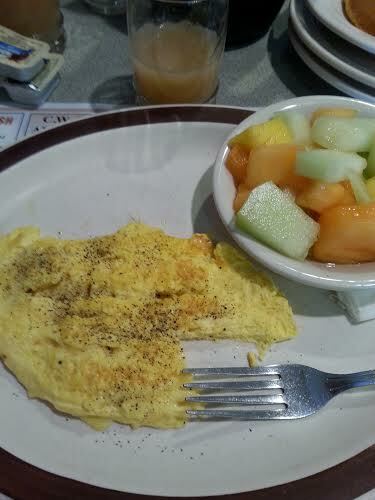 When I have a regular omelette, I start to feel hungry in a couple of hours. This kept me satisfied almost until lunch time. I eat pretty early so this was an accomplishment. 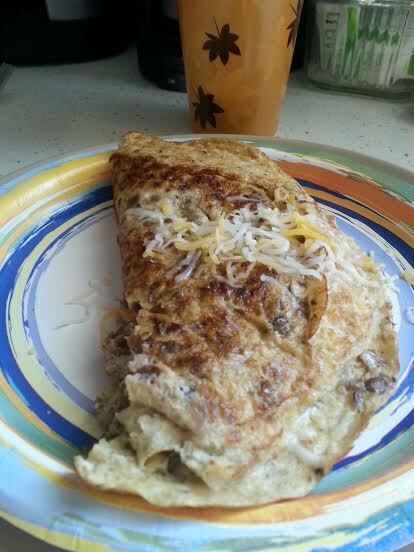 It also gave me a nice protein boost of 4.5 extra grams over the regular omelette. I’m pretty excited that I tried this and I’ve tried it again since I first figured it out. Sounds weird I know, but give it a try! 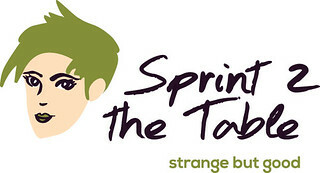 Be sure to check out all of the wonderful strangeness over at Sprint 2 The Table today. Here I am, back for my third try at Thinking Out Loud! I’ve had so many nice comments on my first two posts. 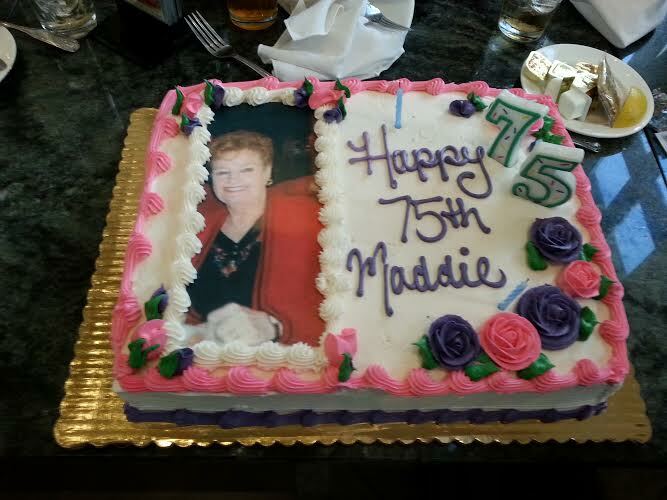 I truly appreciate all of your kind words. Again, I haven’t really planned anything out so it’s more Fly By The Seat Of Your Pants time. Let’s see how this works out. Be sure to check in with the other posters on Amanda’s blog, Running With Spoons. ~I think that all of the emotions that should have come out during my weeks of recuperation, have been stored up and are rearing their ugly heads now. I’m feeling very disjointed, disorganized and not myself in a lot of ways. I need to focus, which is a story anyone who has read BCDC for awhile has heard before. ~I feel a bit out of control with my food as well. NOT a good thing. I’m proud of how I’ve been doing with staying under my Weight Watchers goal for over a year. I probably shouldn’t be too hard on myself. I was told before the surgery that you need to eat to heal. I did that and now I find myself wanting to continue to eat that way. During recovery, I ate and ate and never gained a pound. Now I have to be more conscious. I know the best way to do that. ~Those of you who have visited with me before have seen this. This is my Weight Watchers journal. If I ever need to bring myself into better focus (not that I EVER seem to be able to get myself completely in focus-not for lack of trying!) I turn to my WW Journal. This is a tremendous tool in trying to keep myself on track and under control. 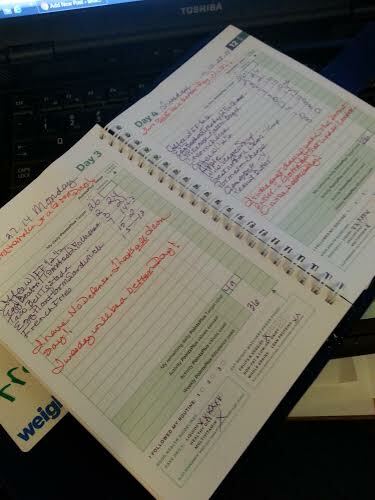 I write down all of my foods and (in red) review what I’ve done and give myself pep talks. At times in my WW adventure, I’ve kept another journal where I tracked my thoughts and discussed my successes and missteps. I’m thinking I need to do that again. I’m really feeling a bit out of touch with what I need to do. I’m still about 12 pounds under my WW goal, but I love the way my clothes feel now and the fact that I have no trouble finding things to fit. I don’t want to let myself slip on that. I want to continue to feel this good. ~I have to commit to doing more cooking, not relying on eating out or ordering in. I can do it, I just need to make myself get back in the routine. I did do the Best thing in the world for me. 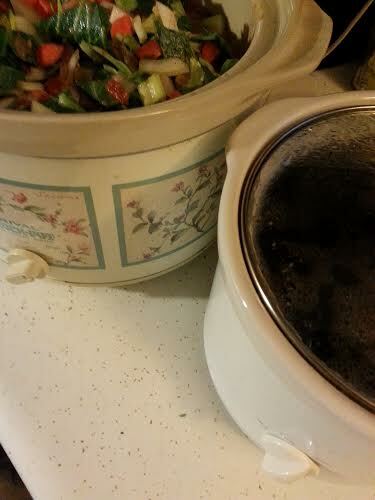 Made a crock pot of my WW veggie soup and a crock pot of beans to go along with it yesterday. That always gets me back on track. ~As I type this, I seem to me motivating myself into a better mood, a clearer head and a more focused vision of what I need to do. I’ve always felt that blogging could work that kind of magic for me. Thinking Out Loud is definitely doing it. It’s allowing me to get things off my chest whether it’s about myself or something else. I like this idea. Be sure to check out the other Thinkers over at Running With Spoons. Thursday is quickly becoming my favorite day of the week! Good Morning and welcome to the type of What I Ate Wednesday post that happens once in a while. The type where I have little or nothing to show in the way of actual food because…I’ll tell the story as I go…which seems to be my routine of late. Be sure not to miss the chance to visit Jenn and company over at Peas and Crayons! Since this is hap hazard at best, I’ll at least try to do it in order. Saturday is always Weight Watchers day around here. You wouldn’t know that I’ve ever even heard of WW if you saw some of the things I’ve been eating, but trust me it is! I’ve been lonely all summer because my two best friends, Gail and Alice have been away in Maine. They’re back and we’re back to our routine. Weight Watchers and then breakfast at the local diner. 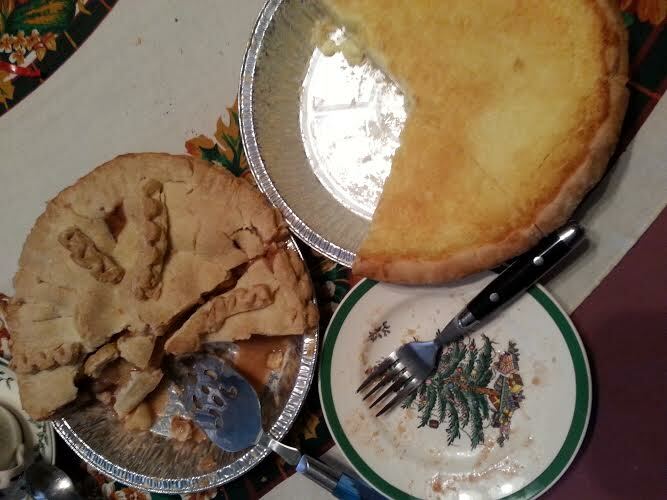 Obviously, I was too hungry to wait for the photo! Egg beaters and fruit. Gail had a great idea. We all really wanted pumpkin pancakes. So we ordered a short stack (3 pancakes) and shared! We got the taste of pancakes but stayed in control. 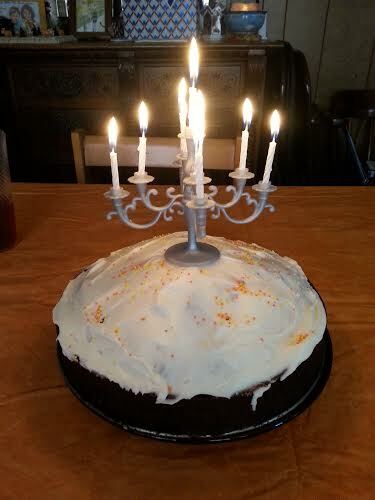 We used the sugar-free syrup. I didn’t have any toast so that made it even better! Pumpkin Everything, Please! If you’ve visited BCDC before, you know that I am the Crock Pot Queen. I use them year round, but Fall and Winter is when they get the most use. Trying to keep myself on track, I was up bright and early Monday morning chopping up the goods for a batch of my version of Weight Watchers veggie soup. 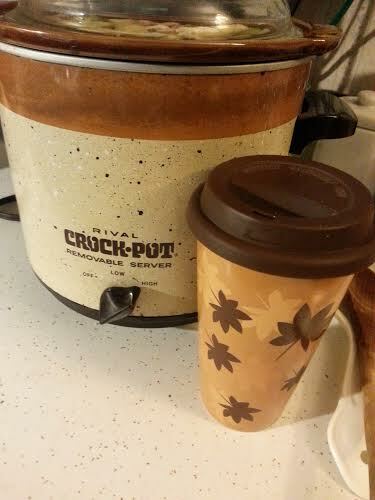 Going along with the pumpkin theme, WaWa pumpkin coffee in the wonderful cup sister Ele gave me a few years ago. I love how they are color coordinated! Yum to both! Eggplant parmesan sandwich from the local pizza place. Should I have? No. Did I? Yes. Sadly, I also ate way too many french fries along with this. It’s gone now, it can’t hurt me anymore. I’m back on track. I promise. No, Really!! Being back on track is proven by this next photo. If it was a piece of art it would be titled White Beans In White Crock Pot. To go along with the WW veggie soup, I started a crock pot of white beans. Thank goodness I remembered to soak them last night. I realized I’m down to almost NO dried beans in the pantry. I have to correct that. 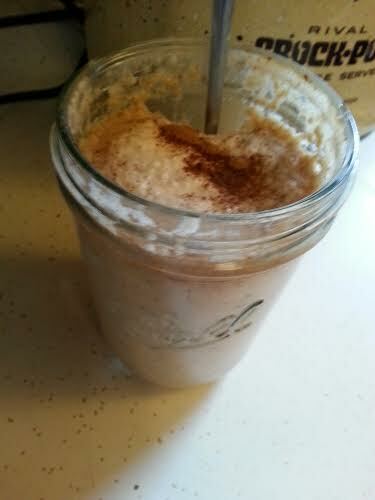 A girl needs her protein! These will be added to the veggie soup but measured for each serving. Much easier to track the Points value that way and Boy do I need to get back to tracking the Points value!! There you have it, What I Ate Wednesday for me this week. I’m hoping that next week will be much better, actually showing food that I cooked and looking like I’m just the tiniest bit on track with my Weight Watchers plan! Be sure to stop over to visit all of the fun at Peas and Crayons, you’ll be glad you did!